evil cream doll. . Wallpaper and background images in the Cream the Rabbit club. HAVE U GONE MMMAAAAAADDDD DUDE I HAVE TO DEAL WITH TAILS DOLL AND NOW THIS!!!!!!!!!! ummmm.... there was a cream doll before this! Y did u do it?! Cream is the exact opposite of evil! OH GOD IT'S ANOTHER TAILS DOLL!!!!!!! RUN FOR YOUR LIVES!!!!!!!! For the last time! I am not EVIL!!!!! WHY DO YOU THIMK I'M EVIL?! *CRYS* YOU MUST HATE ME! 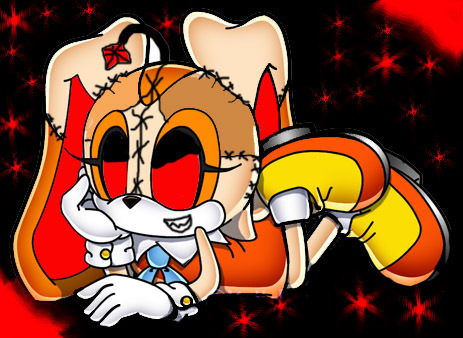 First Tailsdoll Then Creamdoll then Sonicdoll then Shadowdoll then Amydoll then Knucklesdoll when will it stop at Silverdoll and Blazedoll? !